Elder Adults-at-Risk (formerly Elder Abuse/Neglect): Reports of physical, financial abuse or neglect of individuals age 60 or older are investigated. Services may be provided to help eliminate the abuse or neglect and to keep the individual at home whenever possible. Vulnerable Adults-at-Risk: Reports of physical, emotional or financial abuse or neglect of individuals under the age of 60 are investigated. Services may be provided to help eliminate the abuse or neglect and to keep the individual at home whenever possible. WORLD ELDER ABUSE AWARENESS DAY! 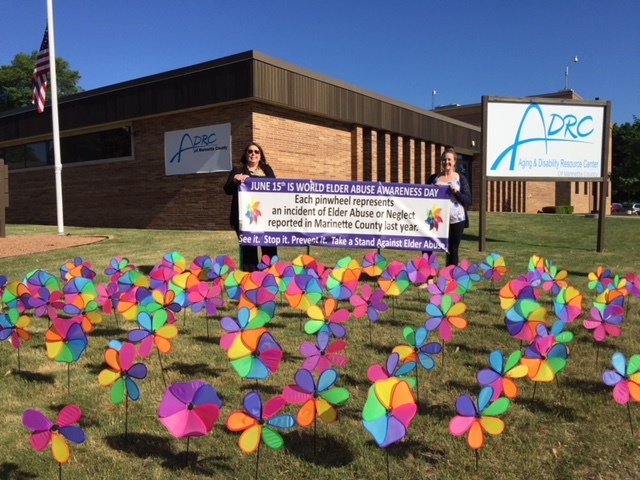 The ADRC of Marinette County recognized World Elder Abuse Awareness Day on Wednesday, June 15, 2018 by displaying pinwheels to represent the number of Marinette County Elder Abuse and Neglect referrals received in 2017. This number increases yearly. 102 pinwheels were displayed in front of the ADRC/Health & Human Services building at the corner of Hall Avenue and Raymond Street. If you would like more information about the signs of elder abuse or to report elder abuse, please contact Adult Protective Services by calling the ADRC at 715-732-3850 or 888-442-3267 or Email adrc@marinettecounty.com. All information is confidential. What is the Scam? Older adults at senior centers, housing complexes, and other community locations are targeted by companies promoting "free" genetic testing, cancer screening, or DNA testing. These screenings are frequently done under the guise of an ice cream social event. During the event, older adults are asked to swab their cheek to collect a DNA sample which will be sent to the lab for analysis. They are then told that the test will be covered completely by Medicare, and all that is needed to process it is their Medicare number. There are other variations of this scam. Sometimes Medicare beneficiaries are being contacted at home by phone and told that they will be sent a DNA testing kit in the mail. In this case, the person is asked to perform the cheek swab at home and then return the kit in the mail for DNA analysis. The caller then asks for the person's Medicare number and reiterates that there will be no charge to the beneficiary. Medicare only pays for the DNA or genetic testing in rare circumstances where it is medically necessary for treatment or diagnosis of a medical condition. These tests must be ordered by the patient's own physician. There must be documentation in medical records to substantiate the need for the testing. If you are contacted by phone, hang up! Do not answer any questions or give out any personal information or your Medicare number. Contact the Wisconsin Senior Patrol at (888) 818-2611 to report any related activities or suspicious requests for your Medicare number. Remember that Medicare will not call you to confirm your personal information, your Medicare number, or ask questions about your health. Report Medicare marketing violations - Medicare does not allow door-to-door sales or unsolicited contact with medicare beneficiaries. Your Social Security number is an important key for an identity thief. Scammers want it, and they think of all sorts of ways to trick you into giving it away. Follow link for more information. Recently spam phone calls were made to IRIS (Include, Respect, I Self-direct) participants and participant-hired workers. The callers sought personal information about the IRIS participant or demanded the IRIS participant make payment to avoid being arrested. The caller said they were from the IRIS program, IRIS consultant agencies, or fiscal employer agents. This is a scam. Do not provide or confirm any information to the call and hang up. Write down who the caller was, what the caller wanted, and the caller's phone number (if possible). Never return a call on the number provided to you in the unsolicited call, and do not trust that the information on your caller ID is accurate. Scammers can spoof their numbers, so it looks like they are calling from a particular organization even when they are not. Contact your IRIS consultant or the IRIS Call Center at 888-515-4747 as soon as possible to notify them of the call. If you have been scammed or if you think your identity has been stolen, you may also report the call to the Federal Trade Commission. The Wisconsin Department of Agriculture, Trade and Consumer Protection (DATCP) has received a number of recent contacts from Wisconsin consumers about a robocall imposter scam that claims to come from AT&T. The calls have been spoofed to show AT&T's actual customer service phone number on recipients' caller ID displays. The automated message in the calls warns recipients of an issue with their internet service related to a security breach. Call recipients are asked to press a button in order to speak to a representative about the situation. Regardless of what your caller ID says, these calls are not from AT&T and are not legitimate. If you receive a similar call, hang up immediately and do not press any buttons. If you do press a button to speak with a "representative," your number will likely be added to a future call list and you may be pressed for money or personal information from a scammer. If you have any questions or concerns regarding your AT&T service, contact the company directly by using the contact information listed on your monthly billing statement. A number of Wisconsin Residents are reporting telephone calls that falsely claim to be from Apple Inc. The robocalls claim there is a problem with the recipients' iCloud or Apple ID accounts. These are tech support scam calls. If you receive a similar telephone call, hang up immediately and do not press any keys to "speak to a representative" or to "end the call." In many instances, consumers have reported that the caller ID information has been spoofed to make it appear as if the call is coming from the Apple Store at the Mayfair Mall in Wauwatosa. In at least one other instance, the number provided was that of an Apple Store in Los Angeles. To read more about imposter scams review DATCP's imposter scams fact sheet. For additonal information on consumer protection issues, visit the Consumer Protection Bureau at http://datcp.wisconsin;gov, send an e-mail to datcphotline@wisconsin.gov or call the Consumer Protection Hotline at 1-800-422-7128. The Better Business Bureau serving Wisconsin is warning seniors and adult children of senior parents to be on the lookout for, and report scams that may target them. The prevalence of scams targeting elders makes extra vigilance crucial. The following are some of the common scams designed to trick consumers, especially the elderly, into giving up their money, property or personal information. Contractor Scam - Beware of scammers going door-to-door and offering seasonal services, such as leaf raking, chimney sweeping or window installation. These con artists may just take your money without ever delivering the service. How the Scam Works: You answer the door, and it's a "handyman." He says that he's been hired by the neighbors to clean the chimney, install storm windows, rake the leaves or performs another seasonal service. He claims that he can give you a discount price because he is already working in the neighborhood. You need the work done, so you take him up on the offer. He asks for a partial payment upfront, and he will return the next day after he finishes the neighbor's job. However, he takes the money and is never seen again. In another version of the scam, the contractor will arrive and perform the service. But in doing so, he finds a "major problem" that needs to be fixed immediately. And of course, he's perfectly suited to perform the expensive repair. How to Protect Yourself from Contractor Scams: Contractor scams appear when homeowners have the most work to do: after major storms and during the change of seasons. Follow these tips when hiring someone to work on your home. Work with local businesses: Make sure the contractor has appropriate identification that tells you it's a legitimate company versus a fly-by-night operator. Things like permanent lettering on trucks, uniforms, printed invoice and estimate sheets, business cards, physical addresses, land line phones, etc. are all signs of an established business. Check references: Get references from several past customers. Get both older references (at least a year old) so you can check on the quality of the work and newer references so you can make sure current employees are up to the task. Check BBB.org: BBB Business Reviews are more than just a grade. You can also read past complaints from customers, find out about licensing and government actions, and more. Make sure it's legal: Confirm that any business being considered for hire is licensed and registered to do work in your area. Also, if in doubt, request proof of a current insurance certificate from a contractor's insurance company. Get it in writing: And always be sure to get a written contract with the price, materials and timeline. The more detail, the better. Watch for "red flags": Say no to cash-only deals, high-pressure sales tactics, and on-site inspections. Don't allow someone in your home or on your roof until you have a chance to thoroughly check them out. The Grandparent Scam - Scammers call an older person and say something such as, "Hi Grandma, do you know who this is?" Responding with a name will allow the scammer to be able to establish a false identity, and then ask for money to solve some unexpected problem. They may say "I'm stranded on spring break" or "I've been arrested" or "hospitalized" and need money for medical purposes, to get out of jail or back home. They'll generally ask for payments be paid via Western Union, MoneyGram, Money Pak cards, or other untraceable methods. They'll also usually state that his or her voice sounds different due to the accident or crisis, and ask that the grandparent not tell their parents. Door-to-Door Sales Scams - People go door-to-door and offer extraordinarily low prices for home improvement work, often stating the offer is only good at the moment. Some of the door-to-door sales the BBB receives complaints about each year include asphalt paving, roofing, tree stump removal, storm damage, and sales of products including vacuum cleaners and magazine subscriptions. Door-to-door salespeople are often transient, and if you're unsatisfied with the work or don't receive the magazines you paid for in advance, there may be no way of finding them to get your money back. Check all companies before doing business with the BBB, first. Take time to think about the offer; compare prices, shop locally, and ensure you know where the company is located should you have a problem later. Health Care Fraud Scams - Scammers will call or e-mail misrepresenting they are Medicare or insurance representatives, stating they will be sending a new card or announcing a new plan and stating personal information is necessary. Sometimes, they'll falsely state that an initial payment needs to be made for the new card or plan. Scammers are simply attempting to get personal or financial information and scam you out of money. Funeral & Cemetery Scams - Scammers read obituaries and call a grieving widow or widower claiming the deceased had an outstanding bill with them and then try to extort money from relatives to settle the fake debt. In another tactic, disreputable funeral homes will attempt to capitalize on family member's unfamiliarity with the cost of funeral services to add unnecessary charges to the bill or attempt to sell high-end products or services. Investment Schemes - During the senior years, it's typical to plan for retirement and make financial plans. Scammers target seniors at this time because they know they're retired and making plans to safeguard finances for their later years. Be wary of pyramid schemes (like Bernie Madoff's), investment schemes promising quick and plentiful returns, advance-fee schemes, and foreign letter fraud schemes. Remember, if it sounds too good to be true, it probably is. Counterfeit Check Scams - While there are many variations of the fake check scam, scammers will often send a legitimate-looking check and ask you to deposit it into your bank account and wire a portion back to them. They may say that you've won money but need to pay a portion in taxes, or they offer you a "mystery shopping" job and say they're paying you in advance, but a particular dollar amount needs to be returned and "you keep the rest." In reality, the money you wired cannot be returned to you. If you deposit the check and withdraw any portion of it, you'll be responsible for paying back your bank the entire amount plus any overdraft fees. It's extremely important to report the fraud you fell victim to, or even the pitch you received but didn't fall for. Older Americans are least likely to report a fraud because they may be too embarrassed or feel ashamed if family members or friends find out. Reporting the situation to the proper authorities and agencies can prevent others from losing money, can help start an investigation into the scam, and will prompt agencies to properly alert others and work toward getting the scheme shut down. Better Business Bureaus share information and offer FREE reports on thousands of companies and charities nationwide and throughout Canada. BBB's work together and with law enforcement to share information and investigate. You can file a complaint, post a personal customer review, report a questionable advertisement, obtain free reports, tips and information, report scams, and sign up to receive free scam alerts and press releases. Go to the website at www.bbb.org/Wisconsin, or call the public line at 414-847-6000 or toll-free in Wisconsin at 1-800-573-1002. Scammers are using caller ID spoofing technology to impersonate the phone numbers of local businesses, neighbors and even you! Watch out for this wacky twist on the classic phishing phone scam. Your phone rings, and you look at the caller ID. You recognize the number. It may be from a local business or a neighbor down the street. But in strange twist, you might even see your own name and phone number on the caller ID screen. You answer the phone, and it's a robo call. Victims have reported several different phishing scams. In one common version, a recording prompts you to verify your credit card number under the guise of lowering your interest rates. With many people rejecting calls from unfamiliar numbers, scammers are increasingly posing as familiar businesses, government organizations or people. Scammers purchase lists of phone numbers and use spoofing technology to trick potential victims into picking up the phone. Posing as your own phone number is great for shock value and for ensuring the number isn't blocked. Hang up, don't press any buttons and, if you received a voice mail message, don't call the scammer back. We all like to have the last word, but returning the phone call may just give the con artist information he can use. Don't trust Caller ID. Scammers have technology that lets them display any number or organization name on your screen. Never give any financial information. If you did not initiate the call, do not provide bank account, credit card or Social Security numbers over the phone unless you have thoroughly done your research and verified the caller.